The Castaway pre-history can be traced back to 1998 when Matus and I, together with some other friends, began to know our musical instruments under the first monicker Crusader. After the year and a half of efforts we came to our first demo CD „Victims of the Holy Season“ ’99, a collection of speed metal songs that sold over 200 copies. In 2001 we changed the name of the band to Dead-Poets-Society and made the second recording „Fait Accompli“, along with the singer Mayo Petranin. The new musical direction towards the heavier and more avant-garde expression caused a little embarrassment by our previous audience, a fact that raised a kind of disappointment in the band. The end of 2001 brought the departure of original guitar players, the period of searching for a new line-up and of a relative creative stagnation. Two years later I met Matus on the stage again, when we both played in another metal band, Galadriel. Sometimes in this period of time the original idea of Castaway was born. The first chapter of Castaway was written at the beginning of 2004. A few months before I realized that my personal plans for the future could not allow me to stay permanently in Bratislava and after a friendly discussion with other members of Dead-Poets-Society I left the band. On the other hand it wasn’t my intention to give up totally musical activities, trying to keep alive some of my latest ideas and songs. I asked Matus to join me and to help me with preparing some new material. I was very happy to see his immediate acceptance and so we began to build a new band. 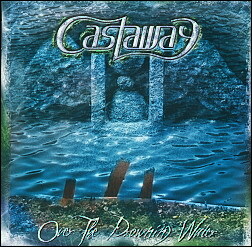 The basic concept of Castaway was to have a band composed of strong individualities that would be able to go on without common weekly rehearsing. To make this idea come true, it was necessary to find the right people to work with. The second positive moment in the process of Castaway’s birth was the approval of all musicians we addressed to join us. And so Mayo Petranin (vocals) and Marian Spisiak (Bass) – both our former Dead-Poets mates -, Janko Kovar (drums) and Peter Bulik (guitar) – both coming from locally well known heavy metal force „Amalthea“ – became the very original Castaway founding members. After the first rehearsing sessions and our live debut in June 2004 in Bratislava the band‘s line-up settled with the arrival of a new bass player Yogi Graus, who brought another dose of verve and energy into the band. We played a few summer festivals in Slovak and Czech Republic and began to focus on the preparation of our first album. In the fall of 2004 I moved temporally to Italy but this fact didn‘t restrain us in composing and arranging new songs. We played occasional live events, including our opening performance for Swedish power metal cult Evergrey, in Bratislava in April 2005. The recording of our first CD is planned for the late summer of 2005.